I captured this image this morning (November 21) at sunrise. Can you find the Moon? It is a waning crescent Moon just one day before New Moon! It was extremely difficult to spot, even though the seeing conditions were excellent, and thanks to Lake Michigan, I had an unobstructed Eastern horizon. 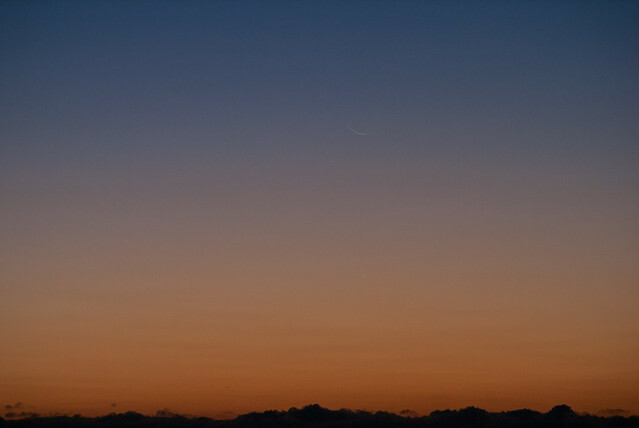 Very thin crescent moons (waning or waxing) are hard to see because they are so close to the Sun, rising minutes before sunrise (waning crescent) or setting minutes after sunset (waxing crescent); on top of that, they are reflecting so little light back toward Earth that their light is easily washed out by the brightening sky of twilight. New Moon is on Saturday, November 22. Try finding the one-day old waxing crescent Moon on Sunday evening, just after sunset. You’ll need a clear western horizon. Good luck! I don’t see the moon. Make sure you look at the full screen version of the photo and look carefully. It’s there! ah! I see it! Very cool.